We conducted a survey of 41 life assurance companies in 19905 and repeated it in 2002 by sending the same questionnaire to 26 companies still underwriting term life assurance. They were asked to assess a fictional proposal for a 20 year policy (paying benefit only on death) by applying an excess mortality rating defined as the percentage increase over the assumed rate of mortality. 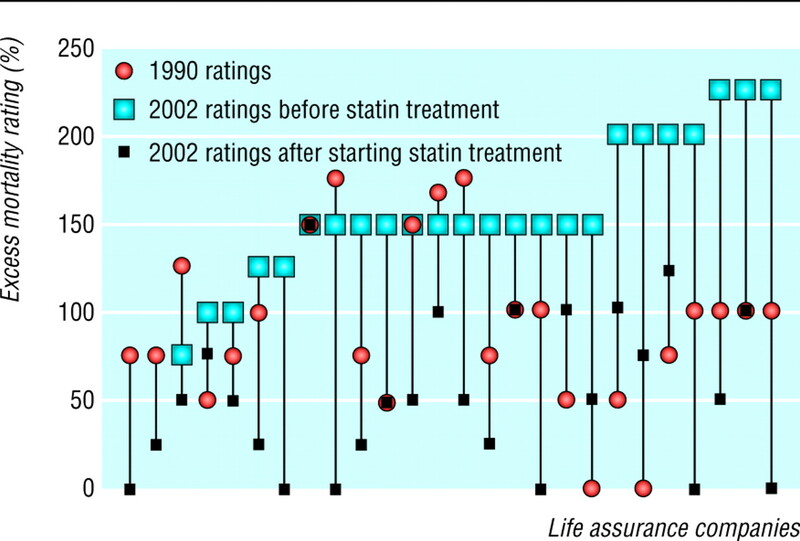 In the follow up survey companies were asked to assess the rating before and after statin treatment. The applicant was a normotensive (120/80 mm Hg), non-smoking, 30 year old man taking no medication, with a body mass index of 22.1 kg/m2 and a normal resting electrocardiogram, whose father had had a non-fatal myocardial infarction aged 45 years. He had no other family history of heart disease, other medical history of note, or tendon xanthomata on examination. The results of the lipid profile (mmol/l) were total cholesterol 11.4, high density lipoprotein (HDL) cholesterol 1.7, triglycerides 1.3, and calculated LDL cholesterol 9.1; and the presumptive diagnosis was familial hypercholesterolaemia. On treatment with atorvastatin 80 mg daily his total cholesterol concentration was 6.2 mmol/l (compared with 10.7 mmol/l on cholestyramine prescribed in 1990). The figure shows the excess mortality ratings applied. Because two companies would assess proposals only from patients receiving statin treatment statistical comparisons were restricted to 24 companies. The mean excess rating increased from 89% (SD 52) in 1990 to 158% (SD 40) in 2002 (difference 69%, 95% confidence interval 41 to 97; P < 0.000, paired t test), but fell to 56% (SD 43) on treatment (102%, 79 to 126; P < 0.000), which was 33% lower (5 to 61; P = 0.022) than the original rating in 1990. The increase in mortality rating in the second survey, together with the substantial reduction in the excess applied to patients taking statins show that underwriters now assess risk more realistically and recognise that the prognosis for familial hypercholesterolaemia has improved with more effective treatment.2 Nevertheless variability in the rating applied was considerable, and patients could usefully be advised to shop around for the most competitive premium. The results of the survey, however, are reassuring and should encourage relatives of probands to be tested rather than being deterred by concerns about life assurance. We thank the life assurance companies for participating in the study. Contributors: HAWN and DM designed the study, TH conducted the survey, HAWN undertook the analysis, SEH and HAWN wrote the paper. All authors participated in the interpretation and critical revision of the paper. HAWN is the guarantor. Funding This work was supported by a grant from the British Heart Foundation (PG2000/015) and was carried out in part with support from the Department of Health and the Department of Trade and Industry for the IDEAS Genetics Knowledge Park.
. UK insurers agree five-year ban on using genetic tests. BMJ 2001; 323: 1021.
. Mortality in treated heterozygous familial hypercholesterolaemia: implications for clinical management. Atherosclerosis 1999; 142: 105–12.
. Extent of underdiagnosis of familial hypercholesterolaemia in routine practice: prospective registry study. BMJ 2000; 321: 148.
. Coronary artery disease in 116 kindred with familial type II hyperlipoproteinaemia. Circulation 1974; 49: 476–488.
. Cholesterol screening and life assurance. BMJ 1991; 302: 891–3.